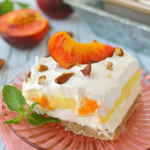 If you love fresh, summer peaches this dessert is for you! 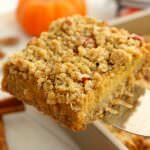 My Peaches & Cream Dessert Bars have a Pecan Sandie cookie crust, cream cheese filling, fresh peaches and toasted pecans! 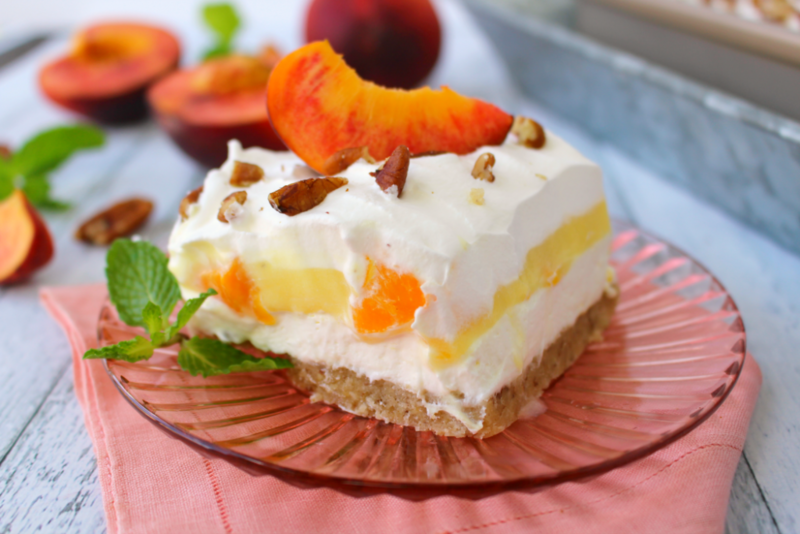 Cool, creamy with a crisp crust and loaded with delicious peach flavor! I’ve lived here in Virginia for the better part of a decade, so in my mind I’ve become a Southerner. There are many things I love about the South – college football, sweet tea and especially peach season! As soon as July rolls around, we begin to see beautiful, juicy yellow peaches popping up at our local farmers markets and grocery stores. As much as my family and I love snacking on this juicy, golden fruit, I decided I must make a sweet, creamy dessert perfect for Southern summer days. 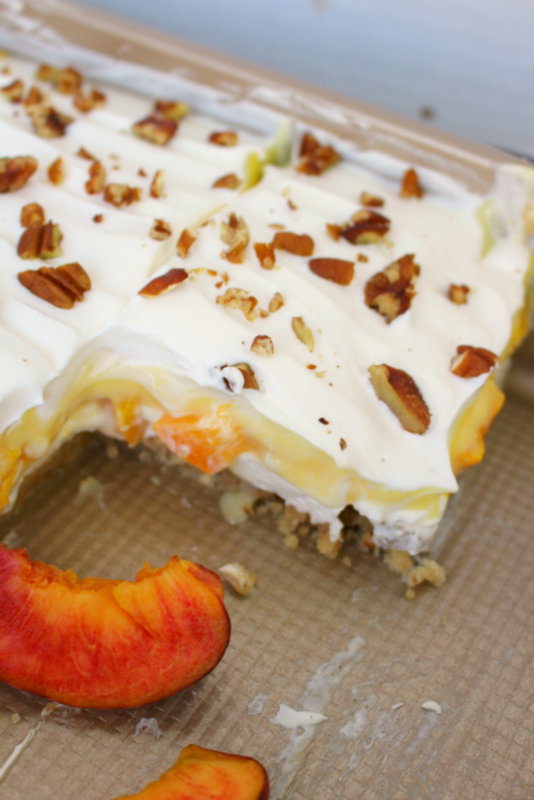 This delicious peach dessert is almost no-bake. With the exception of baking the crust for about 5-7 minutes, simply to crisp it up, this dessert requires no additional cooking or baking. The wonderful, creamy layers of this dessert are perfect for enjoying on a warm summer evening, perhaps sitting on the porch, with friends and family! This dessert would be amazing with my Ginger Peach Iced Tea! The pecans in this dessert add the perfect crunch to go with the creamy layers. Both in the crust and then sprinkled on top, the South’s favorite nut goes perfectly in this dessert. 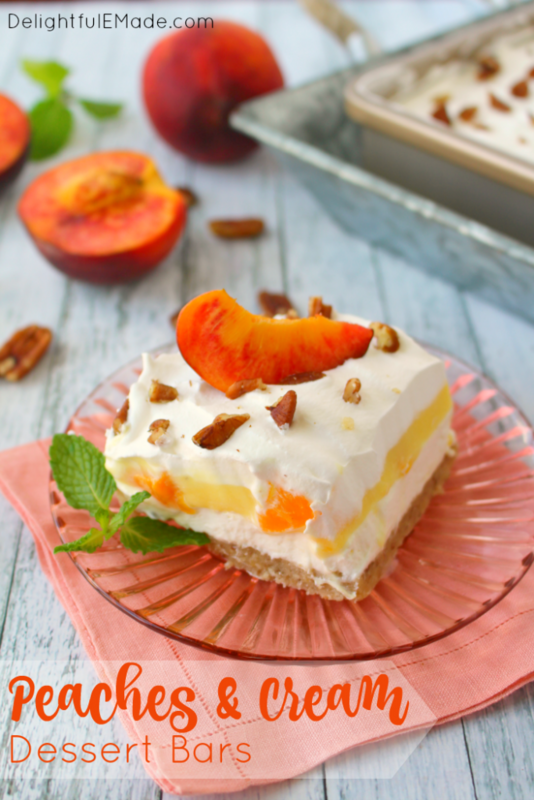 If you love fresh, summer peaches this dessert is for you! 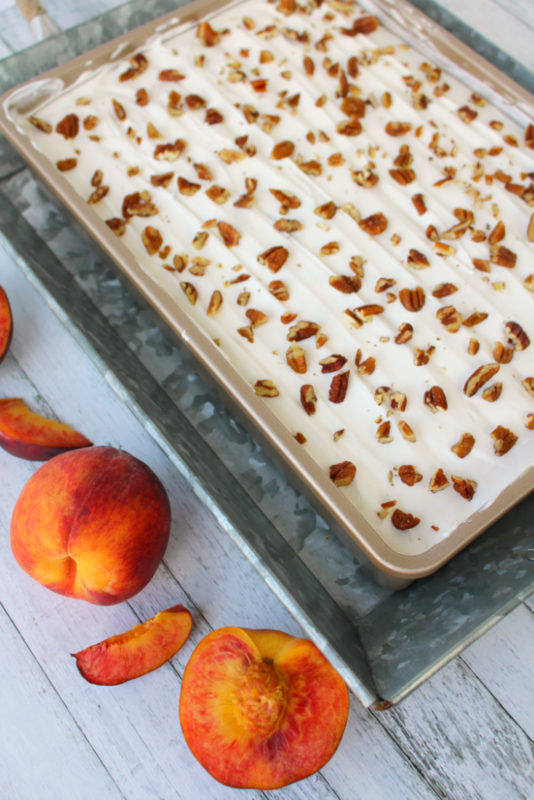 My Peaches & Cream Dessert Bars have a Pecan Sandie cookie crust, cream cheese filling, fresh peaches and toasted pecans! You don't have to be a Southerner to enjoy this fabulous dessert! Preheat oven to 350. Lightly spray a 9x13 pan with non-stick spray. Set aside. In a food processor, crush the cookies, pecans and sugar together. Stop to pour in the melted butter. Pulse a few more times to combine. Pour out into the prepared pan. Press crust mixture firmly and evenly into the bottom of the pan. Bake at 350 for 5-7 minutes just to set the crust. Remove from oven and let cool. For the cream cheese layer, cream together the cream cheese, powdered sugar and milk until smooth. Fold in the thawed whipped topping. Spread over the bottom crust. 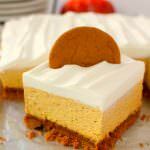 Place in refrigerator while making the second layer. For the peach layer, peel and cut fresh or canned peaches into chunks. Add the peach chunks to the top of the cream cheese layer. Mix the pudding mix and milk. Pour over the top of the peaches. Top with the remaining container of frozen whipped topping and sprinkle with the toasted pecans. Refrigerate for at least 2 hours before serving for the dessert to set-up. Slice and top with additional peach slices if desired. 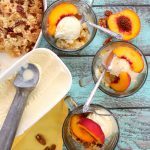 I hope you get the chance to enjoy this amazing dessert this summer with fresh peaches. If the season passes you by, no worries. A great substitution is frozen or canned peaches, which means this dessert can be enjoyed all year round! 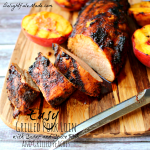 I love peaches and peach season - this looks like a great way to use the bounty! 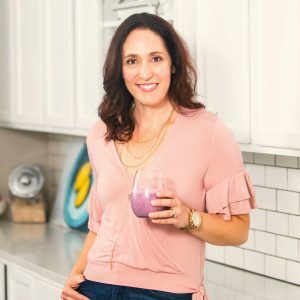 Thanks for sharing at the What’s for Dinner linky - and don't forget to leave a comment – if you comment and your post is featured next week, it will also get pinned and tweeted! These look amazing! Perfect end of the summer dessert! Thanks for sharing on Family Joy Blog Link-up. Please come back and join us again! Peach summertime desserts are wonderful. Everything about this screams breakfast! Too bad I'm stuck with plain ol' yogurt this morning! Looks so good. We love peach desserts. Thanks for sharing at the #InspirationSpotlight party. Pinned & shared. See you again soon. Yum, so happy that it is peach season! This looks wonderful! Thanks for sharing at the What's for Dinner party. Oh this looks so good! Pinned.